JOE HAS PERFORMED WITH THE NEVILLE BROS, THE MCGARRIGLE SISTERS, THE CHIEFTAINS, WILLIE DIXON, LEVON HELM, RY COODER, ALBERT LEE and more, so you know it’s got SOUL! 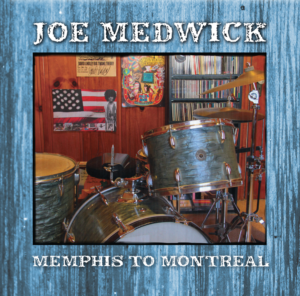 Joe Medwick, Memphis to Montreal. In what has to be the album surprise of the summer, all-around soul man Joe Medwick put a call out to some of the funkiest musicians on the planet, wrote seven new keeper songs, then bumped them up next to six classics and proceeded to set it all on fire. Really. Who knew a man who had been a record retail whiz, valued writer, and overall scene stealer had so much musical beauty bottled up inside him? Musicians Mike Finnigan, Johnny Lee Schell, Hutch Hutchinson, Joe Sublett, Albert Lee, Gary Mallaber, Garth Hudson, John Inmon, David Jackson, Tony Braunagel, Jennifer Condos, Carmine Sardo, Joel Savoy, Gia Ciambotti, and Lynne Coulter don’t show up for just any session. Most of the tracks were recorded at Studio City, California’s Ultratone Studios, but they just as easily could have been done at Stax, Muscle Shoals or, hell, Levon Helm’s Woodstock digs. Medwick’s vocals are a timeless meditation on how music is meant to enter the body and mind, then spread warmth and fullness throughout through the sharing of a joyous glow. It’s stunning just how strong this album is. Which, of course, begs the questions why the man from Watertown, New York and all points America took so long to share such strengths? Like most other things he’s done, Joe Medwick knows when the right time of the night time is, and never makes his move too soon. Bless his heart. After many stops and starts from LA to Woodstock to Austin and back to LA, Joe has wrapped up his Memphis To Montreal sessions at Johnny Lee Schell’s Ultratone Studios in Studio City, after starting the project in Austin and Woodstock. With musical contributions from Grammy winning brilliant friends like Albert Lee (Eric Clapton, Emmylou Harris), Mike Finnigan, Hutch Hutchinson, Tony Braunagel and Johnny Lee from Bonnie Raitt’s bands, Joe Sublett from The Texicali Horns (The Band, Little Feat, Taj Mahal), Gary Mallaber (Van Morrison, Bruce Springsteen), bassists David Jackson (Dave Alvin, Hoyt Axton), Jennifer Condos (Ray LaMontagne, Boz Scaggs), Texas guitar legend John Inmon (Jerry Jeff Walker, Jimmy LaFave), Cajun fiddle phenom Joel Savoy (T-Bone Burnett, Savoy Family Band) and legendary Rock and Roll Hall of Famer, Garth Hudson (from The Band), Memphis To Montreal features handpicked original songs, as well as selected covers by Bob Dylan, James Taylor, Dan Penn and more. Memphis To Montreal is dedicated to Joe’s too-soon gone friends LEVON HELM, KATE McGARRIGLE, TIM DRUMMOND, LONNIE MACK and Joe’s late brother PETER MEDWICK.